We want to wish you a Happy Easter from Valley Fabric Shop. What a great time of year! We have much to be grateful for, especially YOU, our friends and customers. We wish you and your families a lovely Easter season. We have a couple of new things to share . . . this new fabric collection "Monkey Around" is just too cute for words and makes us all nostalgic for the days of sock monkey dolls. We'll soon have a new sample created from these adorable fabrics. If you were not able to attend our "Scrap Magic" on March 22, here is a peek at one of the quilts we shared. We demonstrated and showed quilts featuring the "disappearing 4-patch" . 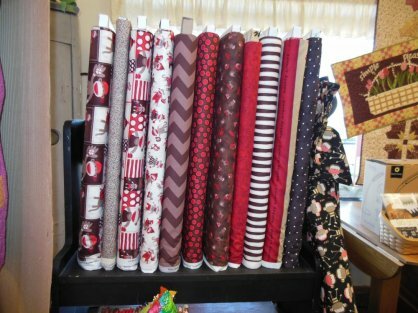 . . several options, "scrappy trip around the world", simple chevron, and the disappearing 9-patch, all made from your stash or pre-cut fabrics. Here is a photo of one of the samples and when you are in the store ask to see the other samples. They are grand! This photo happens to be a baby quilt made with "disappearing 9-patch" blocks. . . sew easy! 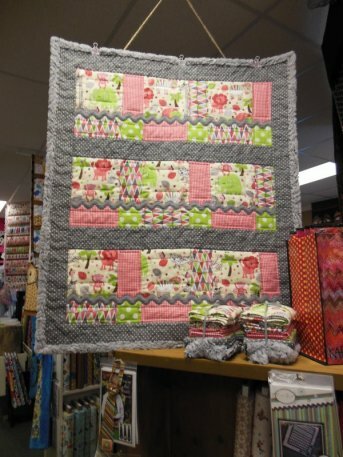 Add a little rick rack, a minkee binding, and you have an adorable, cuddly quilt for baby.